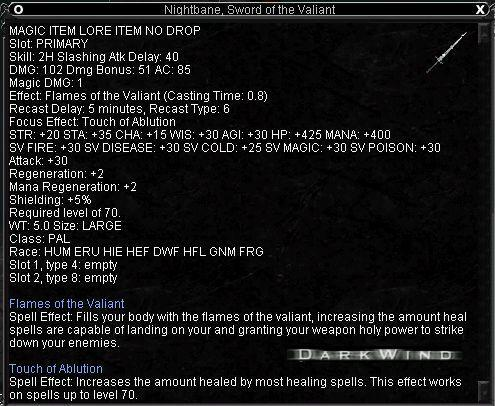 Item Lore: The blade glows with the virtues of a valiant knight. I feel like the graphics of 2.0's aren't as kool as they could be. 1.0's almost always look better in my opinion. The graphics of this weapon looks too similar to an Elaborate Defiant Claymore if you ask me. I might be wrong but i believe still highest damage weapon in eq. Totals out to 111 Damage (+ 1 Magic) = 112 Damage total. This is Best Self Buffed. I did Exclude Over-Haste. Max is another 10% Haste. Better then any TSS I have seen so far. remember the exact number but its somewhere around 8 Damage. make sure you remove your old augments on your 1.5... or else clicking combine for the final 2.0 combine eats up your augment! looked at the damage on this thing... wow..
+4 damage from the Epic Augment quest, so 106.. then, I'm not knowledgable on 2HS damage augs, but I know that the end guy for GoD dropped a +5 one (and so I'm assuming there's better now), but that even puts it up to 111.. and maybe the other aug slot can even get a damage bonus? But, in any case, I know this can easily get to at least 111 base damage! I'd use my Ture sword and AM shield over this for tanking any anything challenging day. Shields up your AC cap. Add in Shield Block and those nifty group heal procs and it's teh win. Actually, I figure that using that combo over this one probably nets about 40% more effective tanking anyhow. It's pretty good when you're not OT'ing something though....although I would rather just about any other class get their globe first before me. There is a new augment slot on epic 2.0 added live 2005-09-21. Are you sure that this "Slot 5" isn't the result of the Epic Augment quest? As far as I know, this quest is unsolved, but this extra slot was to be the reward for it. I actually spent the time to figure the DPS ratio of all the hybrid/melee 2.0 epics with the lvl 70 dmg bonus and it turns out this is 2nd only to the berserker epic. I didn't figure in dual wield though, which could be why warriors are dead last. A Paladin is a holy warrior, fighting for good in all aspects of life. only damage paladins CAN do is from their weapon, that is all. SK's got lifetaps/nukes/dots to increase damage output. warriors have so many reasons why they outdamage knights (at least paladins) anyday : innate higher weapon skill and offense caps, rampage, flurries, Ambidexterity (improved dual wield), ferocity (improved double attack), offensive disciplines, etc. knights get none of these abilities. They have always been bias to paladins. even verant said so, i dont have a problem with it though , they are the "holy knights"
Yeah, I've always thought that the names for the pally epics 1.5 and 2 should have been switched. Redemption just sounds cooler. Finally something to play for. Thanks Sony. You may be able to use Bash with this,but I understand what you mean....I prefer my Pally to use a shield and 1HS....it just seems more natural. And he looks better that way,too. I don't understand SOE's logic in giving Paladins so many 2Handers....even the Newbie Quest weapon(from newbie armor quests) is a 2Hander. Warriors can dual-wield,so that doesn't make sense either. Berserkers use 2HS so it makes sense for them to use something like this(their Epic 2.0 is also nice tho :-) ). ya u get 2 hand bash + it has 85 ac. id take 102(+1 magic) dmg 2hs over anyother 1hs and sheild in the game. With Epic 1.0 you can do BASH without the aa. Not sure if it works with epic 1.5 and/or epic 2.0. If you're doing 51 dps with this sword do you really care if you no longer have that extra 110 bash dmg? Well, considering you can get this i'm sure you'll have all of your offensive AA's trained. This sword pulls about 250 to 300 dps. Plus paladins get bash AAs that increase the damage you do with bash. This weapon is about dps for paladins. As you can see the hp and mana licks a piece, considering you can get Blade of Forgotten Faith which is 300+ hp and a shield with 300+ hp no problem. SoE needs to upgrade the hp/mana, possibly the effect. The effect is barely an upgrade from the 1.5. Wow!! This is very much worth working for! Gratz to Madlez (I love the DE illusion!)! !